Hadi Mahabadi is vice president and center manager of the Xerox Research Centre of Canada (XRCC). He was named to this position in September 2004. XRCC is part of the research and technology organization of the Xerox Innovation Group. Sandy Staggs (SS): What role and level does innovation play in your business/business model/culture? Hadi Mahabadi: Innovation plays a major role in a technology-based company like Xerox; from the creation of ideas for improving current core businesses and/or creating new businesses, development and delivery of products/solutions to market, and understanding current and future customer needs to the processes used to conduct business effectively. Xerox spends five to six percent of revenues on RD&E to make sure development and delivery of new and improved products and solutions address the needs of Xerox’s customers. Xerox also innovates to improve current internal processes and creates new processes that help Xerox employee effectiveness. Post-sale activity including supplies and services is an important part of Xerox’s business model. Within the Xerox Innovation Group, a significant amount of R&D budget is allocated to the creation of technologies that support this part of the business. Xerox Research Centre of Canada (XRCC), which is one of four award winning research centers operated by Xerox, has the global mission of conducting research and generating new material technologies to support Xerox’s post-sale business. At XRCC, 130 employees create approximately 130 patentable inventions per year. A similar ratio of inventions per researcher is enjoyed at our other Xerox research centers. Innovation impacts employee culture in an extremely positive way. Xerox believes in fostering its key asset: the employee, as well as employee satisfaction. By doing so, we hire and retain more qualified candidates. By maintaining a high level of employee satisfaction we enjoy a high level of productivity on a regular basis. At XRCC, we have a very high level of employee satisfaction, as measured by the Employee Satisfaction Survey. This has resulted in a research body that generates 1.5 patentable ideas per year per scientist, and the creation of four to six new technologies every year. SS: Can you name some tools and techniques you have utilized—and with what result? What constitutes a good result? Ideas/concepts ratios & market success? Hadi Mahabadi: Hiring and other HR practices: At XRCC, we have a diverse group of very qualified researchers. Cultural diversity is critical to innovation—different people looking at the same problem see things differently, and in turn, provide different, and often more effective, solutions. We currently employ more than 130 people from over 35 different cultural backgrounds. We also benchmark compensation annually and make sure the XRCC compensation program is competitive with industries hiring the same competencies as us. We have a development program in place to advance employee skill. Management practices: Xerox uses a matrix management approach that promotes cross competency collaboration and innovation. Brainstorming is a process we use to make sure all ideas and thoughts from diverse members of our people are captured, understood and considered. Management is involved in conducting mentoring programs and creating personal development plans and other activities aimed at advancing employee skill. Management encourages researchers to attend XRCC’s Friday Seminar Series where they can share knowledge and tools as well as attend outside seminars to hear important speakers that encourage acquisition of new skills and expansion of existing knowledge. Hadi Mahabadi: At XRCC, we have a Reward & Recognition (R&R) program aimed at encouraging innovation. Apart from this internal program, we actively pursue recognition outside of XRCC as an innovative research centre. A focus on our researchers innovation-related accomplishments are acknowledged through external awards. We also promote the facility and our accomplishments through an international public relations program. In 2007 XRCC received five external Technology/Centre awards: Nano 50 (EA Toner); Nano 50 (POE), Immigration Success Award; Wall Street Journal Award (erasable paper); Time Magazine award (erasable paper). Our employees also received five external individual recognition awards: IS&T Journal Award; PEO Engineering Medal; PA50 Award; and key appointments within technical institutions such as The American Institute of Chemical Engineering CTOC Chair, and The Chemical Institute of Canada/MSED chair. Customer Led Innovation: We differentiate products and solutions that create customer value by working directly with the customer. This is enabled by technology showrooms at our research centres, where Xerox researchers and scientists, in partnership with our business consultants and sales force, host hundreds of customer events and functions every year. This is not only an opportunity to learn from our customers, but also to work with them at applying technologies in order to create new breakthroughs. SS: Are you collaborative? Do you outsource or use outside consultants and companies? If so, how? Hadi Mahabadi: XRCC believes collaboration and partnership improves effectiveness. Xerox’s well known partnership with Fuji Xerox is an example of successful, long term collaboration. We use an open innovation approach to increase our capacity for creating ideas and delivering new ideas to the market in a faster, more economical way. We also partner with universities, government research labs and open innovation companies to develop new ideas and solutions. A recent example of open innovation collaboration is our partnership with the National Institute of Nanotechnology (NINT) and the government of Alberta. SS: Have you used online ideation/innovation/collaborative resources such as software, online sites, etc.? If so which ones? Hadi Mahabadi: Collaborative tools used at XRCC include: Docushare, Wikis, Microsoft LiveMeeting and international video conferencing, to name a few. We also use blogs, ESurveys and Cross Think (a tool used for brainstorming information on a particular topic online by allowing employees access to submit information anonymously). Hadi Mahabadi: Researchers at XRCC invented and developed a breakthrough toner manufacturing process called EA Technology that uses nanotechnology to grow toner from nm sized toner particles. This technology allows the control of toner size, shape and morphology, resulting in sharper images. EA toner is an environmentally friendly process that uses 35% less energy than traditional toner and enables customers to print more pages from the same amount of toner. This novel technology is protected by 400 US patents and is now being used in more than 10 Xerox Products. Hadi Mahabadi: Developing re-usable paper. We have developed a paper that does not need ink or toner for printing and erases printed images within 24 hours. SS: What type of training have you done? Six Sigma? Edward DeBono? Hadi Mahabadi: Six Sigma and Design for Lean Six Sigma (DfLSS) training is part of the XRCC and Xerox training. Almost all researchers in XRCC are trained for DfLSS. Hadi Mahabadi: We use brainstorming, collaborative tools and problem solving methodology within Xerox to identify possible solutions. We also tap into our partners or use the open innovation approach. Hadi Mahabadi: We have many books in our on-site/online library that we recommend to our researchers for reference in order to encourage innovation. Many are project specific, so it’s hard to recommend just one. SS: Have you or will you try sites like IdeaConnection that give you access to thousands of great minds? SS: What factors make online innovation activities appealing? What more would you like to know about collaborative online ideation? Hadi Mahabadi: Ease of use and timeliness of tools. Hadi Mahabadi: Most of them are new and have not yet fully established a reputation. I would not be comfortable recommending any at this stage. Hadi Mahabadi: Thank you for allowing me to share my comments on this important topic. Mahabadi joined Xerox in 1981 and has held a variety of managerial positions, including manager, materials design and synthesis lab; manager, materials design an integration lab and XRCC associate centre manager. Mahabadi has led teams that developed materials for many of Xerox’s product platforms, including toner resins and carrier coating materials for LAKES, the iGen3 digital press, and the DocuTech100-120; as well as solid ink components. He has been instrumental in the development of Emulsion Aggregation, the new generation of toner technology that was introduced into the market in 2001. In 1997, Mahabadi received the Xerox President's Award, the corporation's highest honor for individual achievement, and in 1998, was the recipient of Xerox's Chester F. Carlson Award for the highest number of US patents. Mahabadi holds over 60 U.S. patents. Prior to joining Xerox, he was Chair of Chemical Engineering at the Tehran University of Technology. 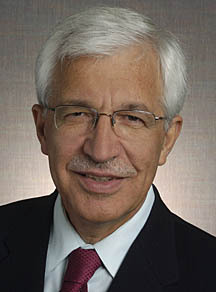 Mahabadi received his PhD in the field of polymer engineering from the University of Waterloo in 1976. Hadi is a member of several scientific societies and was selected as a Fellow of the Chemical Institute of Canada and International Union of Pure and Applied Chemistry. He was secretary and chair of the Macromolecular Science and Engineering Division of the Chemical Institute of Canada. Mahabadi lives in Mississauga with his wife and two sons.